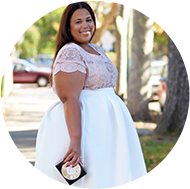 I was so honored to be featured as Modcloth's Blogger of the Moment. As long time fan of the site, I have always coveted and shopped many of their vintage inspired looks. Modcloth carries sizes up to a 4X. The best part of the feature is getting a dress of my choosing named after me. Of course the signature dress included leopard. Check it out below. It's a fun dress/jacket combo. It's called the Garner Style Dress. #squeal. I also wanted to share with you an upcoming model casting with Modcloth. This is for LA aspiring models. Modcloth is currently casting plus size models size 16 and up. If interested send the following to modelsla@modcloth.com: A headshot and full length photo, your measurements, and your contact information and location. Good Luck! Happy for you! You look great! I absolutely love this look! I admire your style so much! Congrats Girl! I am so happy for you! Congrats!m I adore your style and your looks are always classy and so well put together!! That's so cool and it looks so good! That's awesome!! The dress and jacket suit you perfectly! That dress is amazing - congrats lady!! Congratulations!!! You are beautiful, and this is so well deserved!! I just discovered your blog via this very feature and so glad I did! Your namesake dress is gorgeous and looks absolutely stunning on you! Welcome, welcome, welcome & thank you!!!! OMG u're gorgeous in that cuty dress ! !